The Fall 2007 issue of KB Journal features new essays by Jason Ingram ("Conflicted Possession: A Pentadic Assessment of T.E. Lawrence’s Desert Narrative") and Eric Shouse ("Suicide: or the Future of Medicine [A “Satire by Entelechy” of Biotechnology]"); Clarke Rountree introduces Burke's First Publications, including "“La Fino de la Homar’” and “Invince Harvey, Jr.” Issue 4.1 also includes review essays by Andrew Battista (Kenneth Burke on Shakespeare, edited by Scott L. Newstok) and Maura J. Smyth (“Civility as Rhetorical Enactment: The John Ashcroft ‘Debates’ and Burke’s Theory of Form,” by Christopher R. Darr). 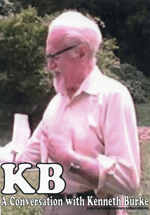 Our new Happenings Editor, Elizabeth Weiser issues a Call for Nominations: KB Society Career Awards (5-1-08) and Bryan Crable announces the Call for Papers: Kenneth Burke Society 7th Triennial Conference (2-1-08). We have now published new Premium Bibliographies (available to Kenneth Burke Society Members; sign-up now), which are introduced by Clarke Rountree also. They include Works about Burke: Theses and Dissertations by Subject Term, Works about Burke: Theses and Dissertations by Thesis Director, and Works about Burke: Theses and Dissertations by University.